You’ve been running your nonprofit organization for years. You had some great growth at the beginning as word of mouth spread, but now growth is plateauing. You’re already on the right track with your website and social media and emails, but you’re not seeing leaps and bounds in membership. Now, you’re ready to take some risks, learn the strategies of the experts, and build a lean, mean, online marketing machine that will take your growth to the next level. That’s what this Membership Growth Online Summit is all about. 7 top-notch speakers over 5 days will give you their powerful strategies for how to take advantage of various online tools to make them work for you. These are experts who were once in your shoes. Heck, even we were. Wild Apricot started off as just a tiny organization with only a handful of clients and we now we service over 17,000 organizations. And that’s why we’re bringing you this summit, for free! We know how tough it is to get to the next level of membership, so we want to do everything we can to help you get there too. Build an amazing outreach strategy. And, as a special bonus for signing up, we're offering all registrants 50% off our e-course, "Board Meeting Hero" — from planning, facilitation, follow up and everything in between, this course is your one-stop-shop to rescue your board meetings, boost productivity and grow your membership. 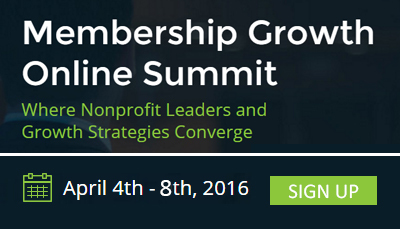 The Membership Growth Online Summit takes place from April 4th to 8th. Sign up here. I attended the Monday webinar but missed the Tuesday afternoon HOW TO BE A GOOGLE ADS SUPERHERO. Can I access that webinar somewhere?